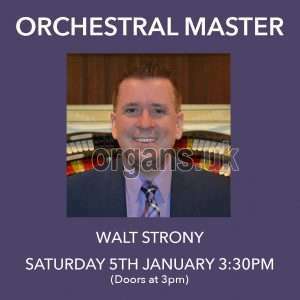 Walt Strony is one of America’s premier concert organists. He made his public debut in 1974 at the age of 18 and has since established himself as one of few organists equally at home playing both theatre and classical organ. Mr. Strony has performed hundreds of concerts from coast to coast in the United States as well as in Japan, Australia, England, and Canada. In addition, he has performed at many conventions of the American Theatre Organ Society and the American Guild of Organists. In July 2007 he performed the first solo organ recital to be presented in many years at New York’s Radio City Music Hall for the American Theatre Organ Society’s 2007 Convention. In June 2016, he was featured for the second time in an evening concert on the famous Wanamaker organ in Philadelphia – the world’s largest fully functioning pipe organ. He is the only living organist to have been twice voted “Organist of the Year” by the American Theatre Organ Society – in 1991 and 1993. In 2011, he was inducted into the ATOS “Hall of Fame.” He has performed with the Calgary Symphony; Allentown Symphony; El Paso Symphony; and Symphony Silicon Valley.